SOUTH DEVON RAILWAY Works "Flat Out"
The South Devon Railway workshop at Buckfastleigh is running flat out with a variety of contract work at present with various internal projects having to take a back seat for a while. One of the latest contracts is to carry out a repair to Swanage's Standard 2-6-4T No. 80078 which arrived by low loader a few days ago. It has been moved in to the main works today, temporarily taking the place occupied by SDR based 3205. The Standard 4 is in need of a repair to a damaged crank pin which will probably require removal of the affected wheelset. 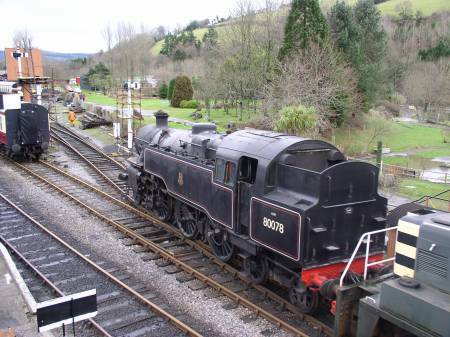 80078 is not the first Standard 4 to visit Buckfastleigh. 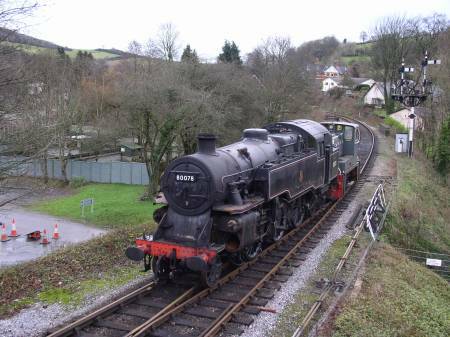 80064 was rebuilt at Buckfastleigh back in the 1970's before transfer to the Paignton & Dartmouth Railway (where it was intended to run it) and subsequent removal to the Bluebell Railway. We were visited in the past by an 80000 4MT off the main one evening on a railtour from Plymouth (if anyone has photographs of this event we'd be pleased to receive them). Wheels in the works for retyring are from various Bulleid Pacifics, GW prairies: 5532, 5539, 5199 and 0-6-0PT 6430. 0-6-0 3205 and prarie 5542 have already been dealt with this winter. Further work on 5542 is nearing completion ready for it to be back on hire for the 2008 season.